Our knowledge of Earth’s biodiversity is quickly growing through databases of museum collections, easy to use biodiversity portals, rich spatial maps and phylogenetic knowledge. However these rich data streams are not inter-connected so the synthetic view of biodiversity is not readily available to researchers and the public. This potential hadn’t been well realised, and we want to unlock it. We envisioned a way to integrate different types of data – species distributions, character traits and environmental information - to generate easily interpretable visualisations of biodiversity with an evolutionary perspective. 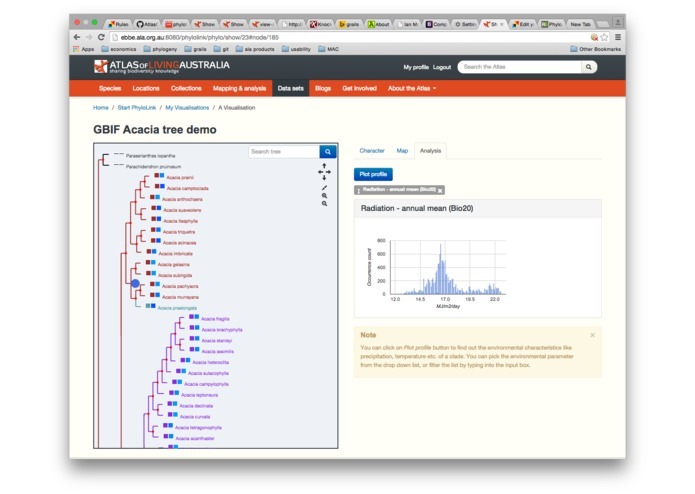 So the project set out to place biodiversity information aggregated from many sources onto the ‘tree of life’ (or phylogenetic trees). 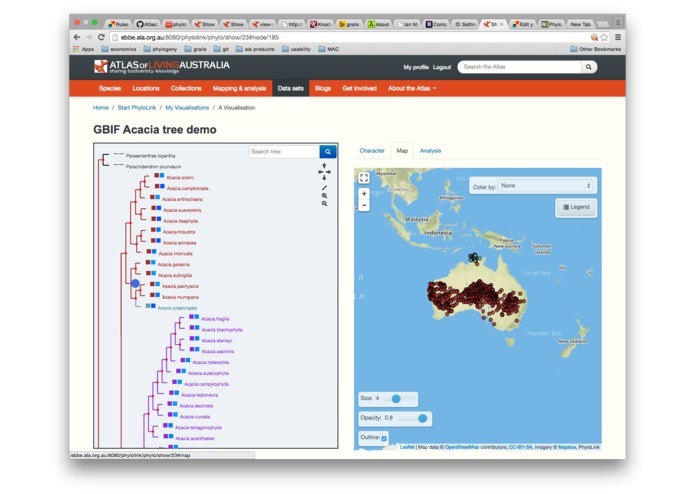 We extended our tree mapping and visualisation tool, PhyloJIVE. 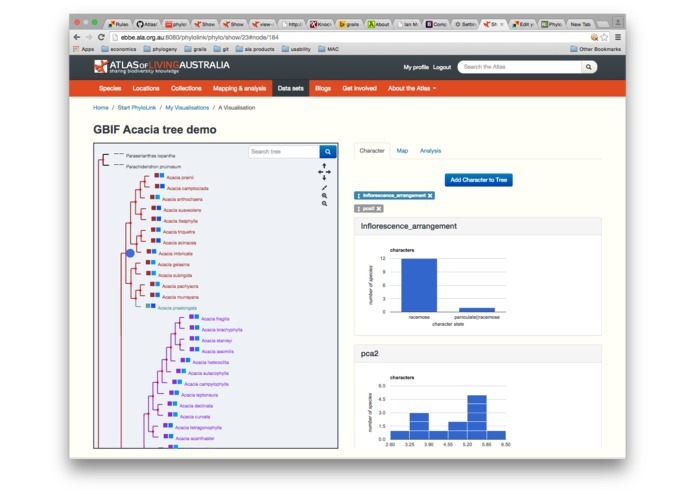 The result is PhyloLink – a new tool to explore biodiversity patterns from a tree of life perspective. PhyloLink is aimed at researchers and conservation managers with an interest in phylogenetic perspectives on biodiversity assessment and management. 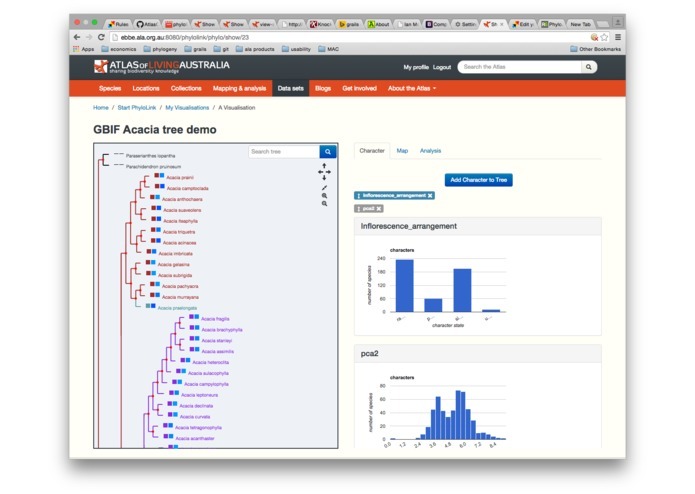 It aims to make phylogenetic approaches accessible to a conservation planning audience, by making source data integration easy, and visualisation dynamic and intuitive. 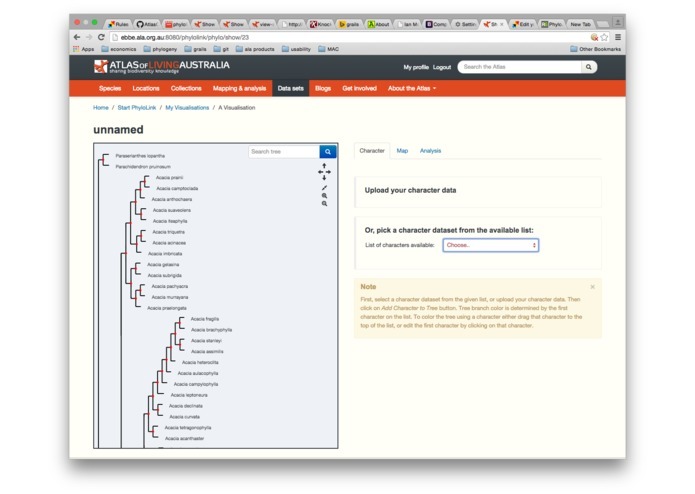 The integrative visualisation of phylogenetic tree, environmental data, species distributions and character data is a key feature of PhyloLink, and enables a variety of new perspectives on biodiversity. One novel feature that we developed is the ability to investigate the environment occupied by organisms within any chosen clade (a group of related organisms sharing a common ancestor), simply by highlighting the clade and selecting an environmental parameter from a drop down list. 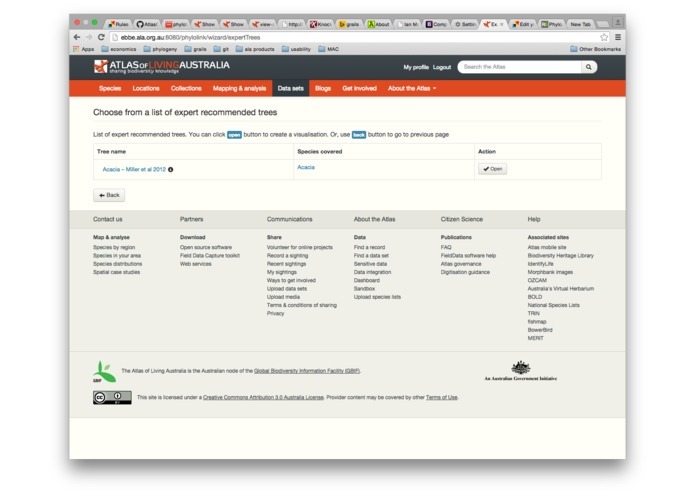 PhyloLink enables knowledge discovery, and sharing that discovery with colleagues. The work we are presenting has most parts developed during the period 3rd December - 2 March. However, PhyloLink is an ongoing project. It has parts developed prior to the competition period. The user interface developed prior to 3rd December are listed below. 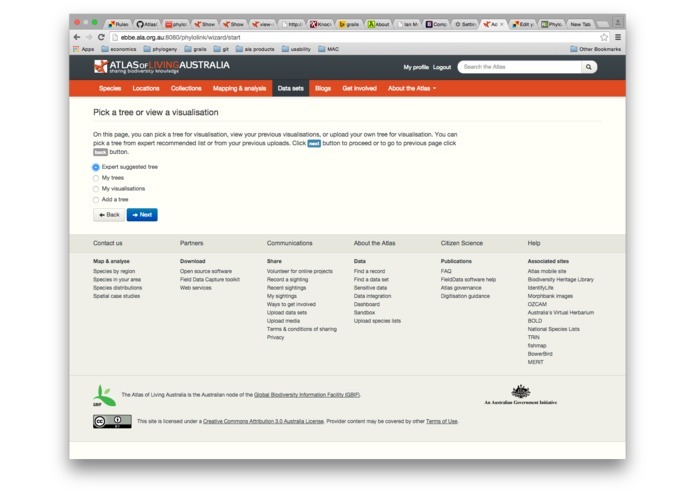 It also uses some web services developed prior to the period. 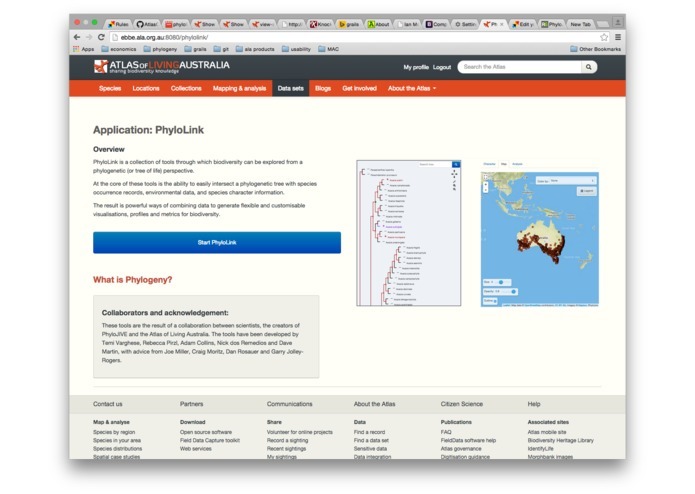 Also, PhyloLink makes use of range of web services provided by Atlas of Living Australia.